Gluten Free Girl has a tantalizing recipe for Homemade Oreos, and I must say they look 150 times more delicious than the store brand ever were. I love how food blogs have become a communal recipe box. We share what we learned from someone else, like the index cards where women used to write recipes, and then the next person passes it on with a few crossed-out ingredients or notes added in red pen. I found the recipe for these cookies from someone in NYC who found it on a blog from Scotland called Kitchen Lab Project. She found the recipe from Deb at Smitten Kitchen, who adapted them from this book. You know that author was inspired by someone else’s recipe before him. Those of you who have to avoid dairy might be adapting this again soon. I can’t see why a buttery substitute wouldn’t work for the butter in both places. If you can’t eat eggs, you could try the flax seed trick. Or maybe you have a better idea. If you adapt this version of the recipe for your own kitchen successfully, will you leave a link to it in the comments? Everyone should be able to eat these. Bake on the middle rack of the oven for 5 minutes, then turn the baking sheet 180 degrees. Bake until the cookies are crisp on the edges with just a touch of softness in the center, about 5 more minutes. Take the cookies out of the oven. After a few moments, transfer the cookies to a cooling rack. Allow them to cool completely. Assembling the cookies. If you have a pastry bag with a 1/2-inch round tip, you can pipe tiny dots of filling onto a cookie. We couldn’t find ours, so we used a teaspoon measure and our fingers to spread the blob of creamy filling toward the edges but not entirely there. Gently, press the second cookie down onto the filling and watch the filling reach the edges. 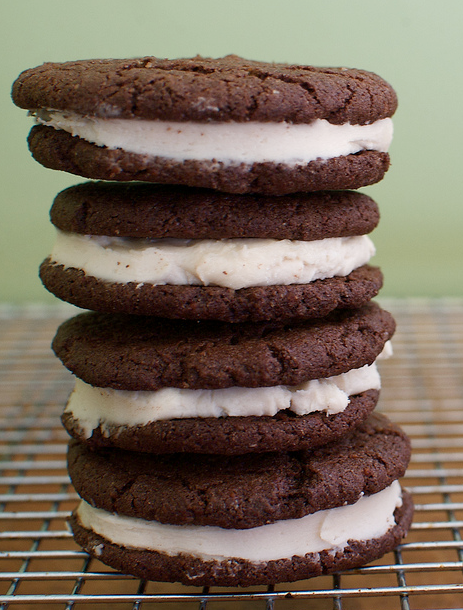 Continue until all the cookies are little chocolate sandwiches with a creamy filling. Oreos. Makes 25 to 30 Oreos. This entry was posted in Baking, Cooking, Culture, Recipes and tagged delicious, frosting, GF Oreos, Gluten free cookies, Gluten-Free Girl, homemade oreos, Oreos on October 26, 2010 by glutenfreepdx.